Anritsu has introduced a four-channel sampling oscilloscope option for the BERTWaveTM MP2110A. According to the company, this enables the integration of multi-channel oscilloscope and bit error rate tester (BERT) in a single unit. Backbone networks and data centres are increasingly using 100G Ethernet to meet anticipated traffic demand for services such as 5G; they are even considering implementing 400G Ethernet. These networks require optical modules that have NRZ/PAM4 signalling, multiple channels and different wavelengths. This typically required expensive high-performance test systems, reports Anritsu, but the pressure to reduce pricing requires more cost-effective test solutions that retain flexibility to support future technologies. The four-channel oscilloscope option halves the unit cost per channel, says Anritsu, while maintaining the same performance. Hardware and software multi-channel support enables the oscilloscope option to deliver high-efficiency measurement in multi-channel as well as multiple single channel modules for high-usability evaluation environments. The four channel option offers a high-performance, economical, all-in-one instrument configuration for combined 1/2/4 channel oscilloscope and BERT; it can be used for both development and manufacturing applications. The BERTWaveTM MP2110A features a built-in oscilloscope and BERT with selection of one, two or four channels for development and manufacturing of 25G to 400G optical devices. 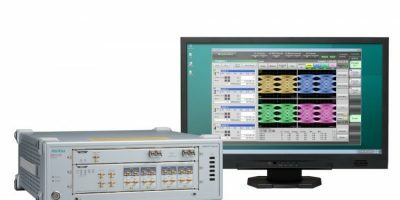 It is claimed to offer the world’s highest sensitivity supporting wide optical signal analysis from 25Gbaud NRZ to 53Gbaud PAM4 with built-in clock recovery option. Target applications are evaluating physical layer performance of 25 to 400G optical transceiver modules, optical cables and their component parts, use in data centres, core or metro networks, 4G/5G mobile backhaul, and 5G mobile fronthaul. Anritsu provides communications test and measurement products and engages customers as true partners to help develop wireless, optical, microwave/RF, and digital solutions for R&D, manufacturing, installation, and maintenance applications, as well as multi-dimensional service assurance solutions for network monitoring and optimisation.